"Famous Winnipeg style rye bread which uses cracked rye and white flour instead of rye flour. 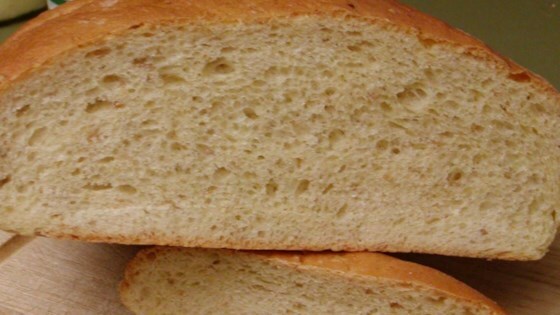 This makes a light colored, richly flavored bread. Adapted for the bread machine." Soak the cracked rye berries in 1/4 cup of water until most of the water has been absorbed. Place ingredients into the bread machine in the order suggested by the manufacturer. Add the soaked rye with the other flour. Set bread machine for the DOUGH cycle, and press START. When the machine indicates the end of the cycle, remove the dough, punch down, and let rest for 10 minutes. Divide the dough into halves, press out any air bubbles, and form into round or long loaves. Place them onto a baking sheet, and allow the loaves to rise in a warm place until they have doubled in size, about 35 minutes. Preheat the oven to 350 degrees F (175 degrees C). Brush the tops of the loaves with remaining milk. Bake for about 35 to 40 minutes, or until the loaf makes a hollow sound when tapped on the bottom. We have corrected the amount of water listed in this recipe. The amount of water was previously listed as 1 cup, but now correctly reads 1/4 cup. Has anyone made this without a bread machine? Is there any order I should mix the ingredients? Excellent! Even without the Gluten!